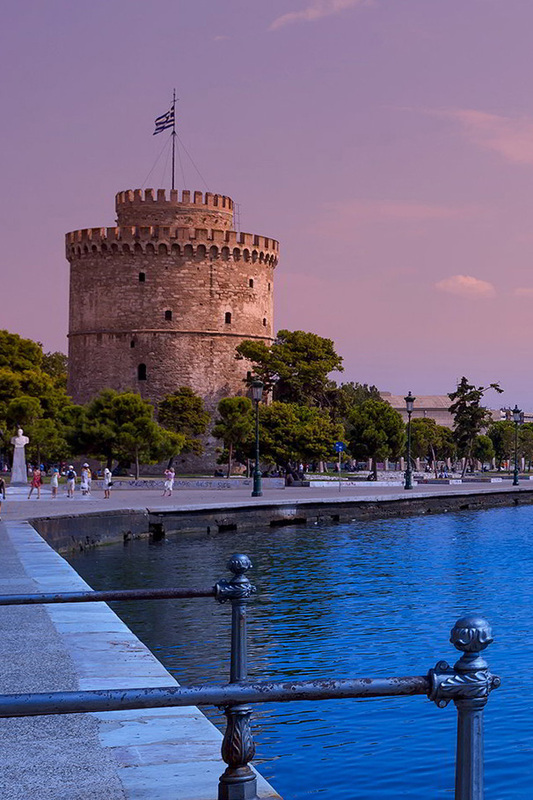 It is the symbol-building of Thessaloniki and one of the most famous buildings in Greece. It is located in a prominent position at the beginning of Nea Paralia and has a height of 33,90m and a diameter of 22,70m. Its original name was “Tower of the Leo”, according to a Turkish inscription of 1535-1536 which was at the entrance of the tower’s outer yard. Since the 17th century, it has been named ‘Fortress of Kalamaria’ and ‘Janissaries Tower’. The White Tower was built by the Ottomans in the late 15th century when Sultan Murad II prevailed on Thessaloniki. The famed Mimar Sinan is likely to be the architect of the White Tower. The Tower was for centuries part of the walls of the old city of Thessaloniki that separated the Jewish quarter of the city from the cemeteries of Muslims and Jews. The Ottomans used the White Tower in the following order. Originally, as a fortress, then as a guard and finally as a prison. After the dissolution of the Order of the Janissaries in 1826, it acquired the name ‘Tower of Blood’ because of the massacres by the Janissaries. The name is preserved even after 1826 because of its operation as a prison of long-term convicts and a place of tortures that was often performed filling the walls with blood. In one version, its modern name appears to be given when a Jewish convict, Nathan Guidili, painted it white in exchange for his freedom in 1891. Another historical source states that the current name of the building was given between 1883 and 1884 as per the request of Sultan Abdul Hamit II. In 1985 the restoration of the monument was completed and the building was turned into a museum and exhibition center. The view from the balcony where the blue-white flag is waving is panoramic and the visitor can gaze at Thermaikos Gulf, Mount Olympus, the Upper Town or East Thessaloniki. The Archaeological Museum is located at the H.A.N.TH. 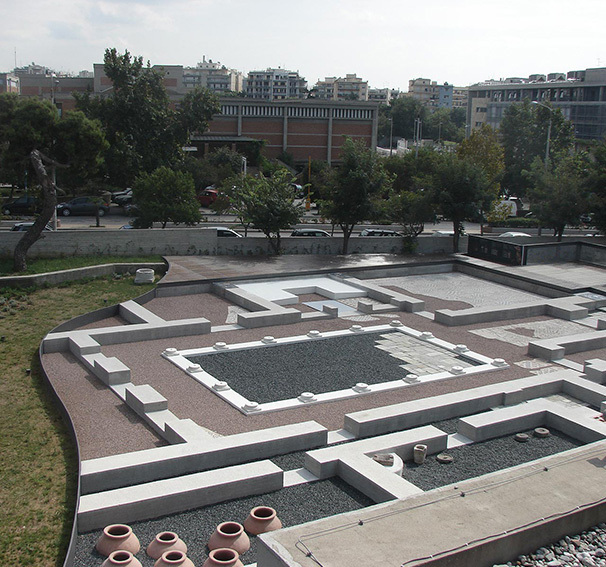 Square, next to the Thessaloniki International Exhibition and Conference Center. It was founded after the liberation of the city in 1912 and the current building was inaugurated in 1962 when the city celebrated the 50th anniversary of its liberation. The architect was Patroklos Karantinos. The exhibits that are hosted in the museum come from the excavations that took place in the city of Thessaloniki and in the wider region of Macedonia. Ιn particular, the museum houses the findings from the excavation research of the Archaeological Service of the Antiquities acovering the prefectures of Thessaloniki, Kilkis, Pieria, Halkidiki. For a long time the museum hosted the findings of the excavations of Manolis Andronikos at the Royal Tombs of Vergina. Inside its halls, guests can admire the findings from the Sindos cemetery. Οbjects of the Neolithic, Classical, Hellenistic and Roman period are exhibited in the external rooms. On the lower floor, the prehistoric collection is exhibited, presenting the diachronic image of the cultural evolution, not only in Thessaloniki but also throughout the region of Central Macedonia. 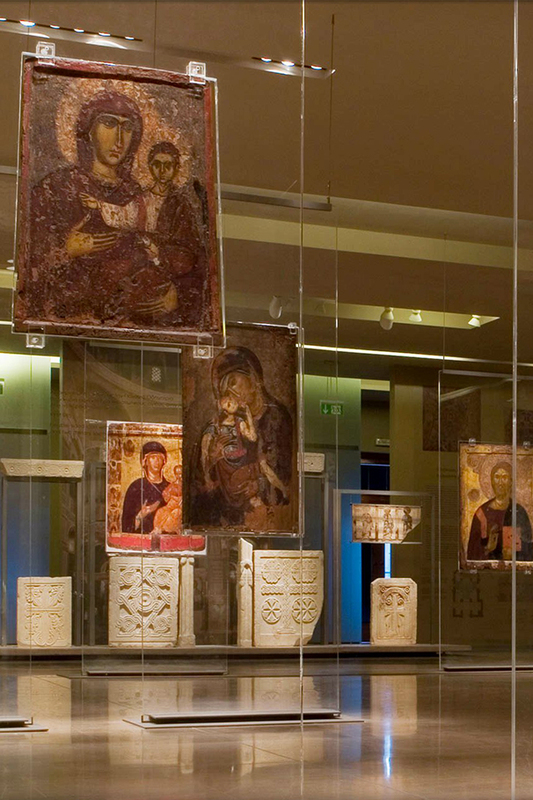 The Museum of Byzantine Culture is located on the Stratou Avenue, behind Thessaloniki’s town hall on an area of 3,430sqm. 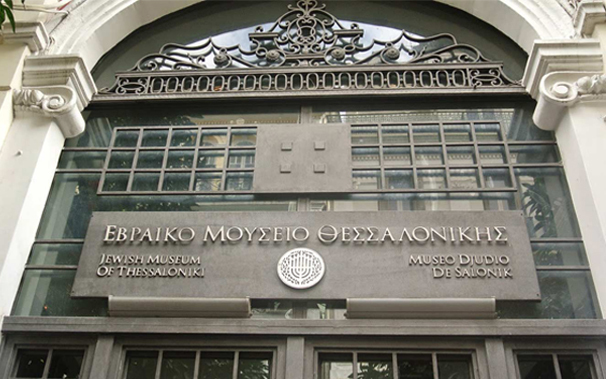 Its operation began in 1994 and was honored in 2005 with the European Council’s ‘Museum Prize’, while the building is considered to be one of the best samples of public architecture in Greece. 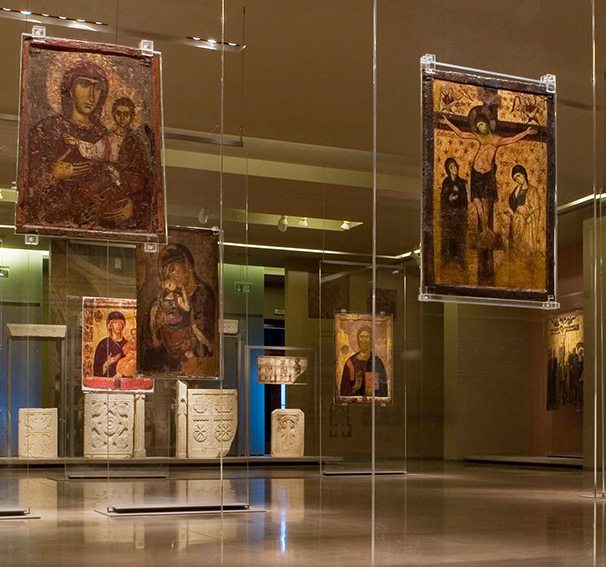 The 11 chambers of the museum host many exhibitions presenting the architecture and decoration of churches in the Early Christian period, aspects of everyday life, housing equipment, clothing and nutrition elements, burial of dead in early Christian cemeteries, tribute to the civilization of the Middle Byzantine period (8th-12th AD), tribute to Byzantine emperors, engraving collections, presentation of the Byzantine heritage after the Fall of the Ottomans, and finally presentation of the course of archaeological objects starting from the excavation until their transfer to the museum. The visitor has the opportunity to understand the cultural and socio-political facts that influenced the lives of people during the Byzantine and post-Byzantine era. The Jewish presence in Thessaloniki is long and intimately linked to the history of the city. 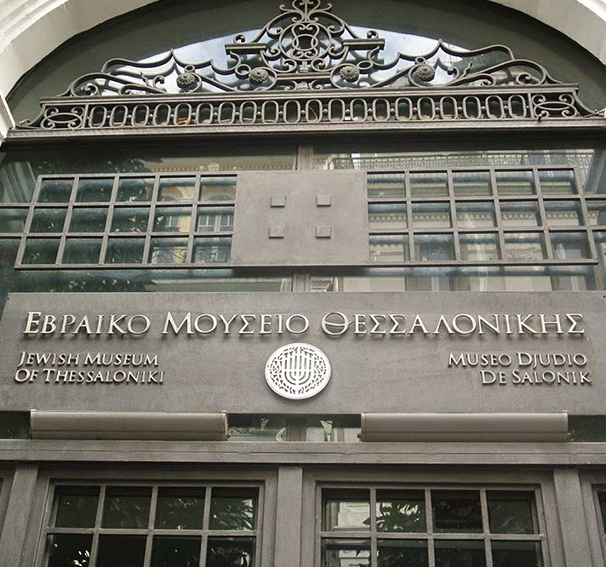 The mission of Thessaloniki’s Jewish Museum is to highlight the rich history of the Jewish community, to preserve the memory of the victims of the Holocaust and to search for the over 2000 years presence of Jews in the city. It was founded in 2001 and it is housed in one of the few surviving buildings since the great fire of 1917. Among many exhibits the guest can see collections of tombstones from the destroyed Israeli Cemetery, building parts of synagogues that were demolished by the German authorities, religious objects, old and rare books in the Jewish language, family heirlooms, ketubot (marriage contracts), public and private documents related to World War II, traditional outfits, fabrics, tablecloths, books and bank account booklets (until 1940). Also, the museum has in its possession the only existing collection of surviving prewar family and school photographs, which has been formed by continuing donations; last but not least, the Museum keeps an important digital collection of business documents pertaining to the Jewish companies of Thessaloniki. Finally, a special exhibition space refers to the Holocaust as it affected the entire Israelite Community of Thessaloniki. The Ethnographic and Folklore Museum of Macedonia-Thrace is located on Vassilissis Olgas Street in a beautiful, well-preserved historical building of the 20th century, known as Modiano Villa, home of the banker Yiako Modiano and his family. Τhe museum’s mission is to discover and study the traditional culture of recent years in several areas of Northern Greece. The collections consist of objects from the pre-industrial era, mainly from the regions of Macedonia and Thrace. They represent all aspects of people’s everyday life during the last centuries to the middle of the 20th century, both in the countryside and in the city. In terms of quantity and variety the museum hosts one of the richest collections throughout Greece. In particular, the objects that the Museum hosts come from markets and donations and include local costumes, jewelery, fabrics and embroideries, craftsmen tools, agricultural tools, household utensils, furniture, musical instruments, toys, church equipment and early forms of machines (cameras, sewing machines). 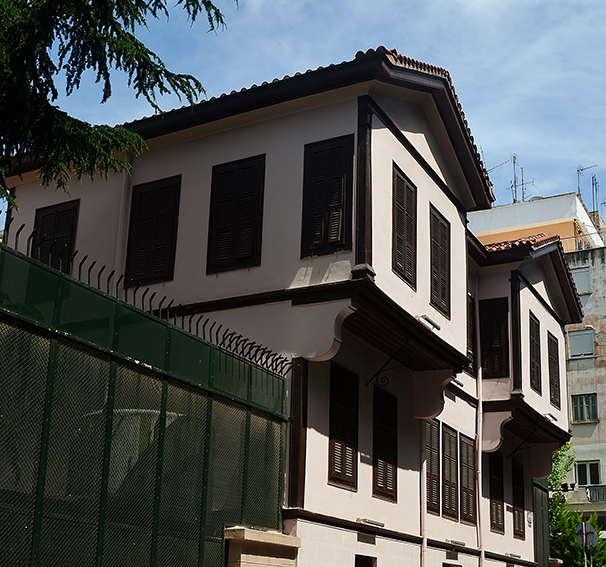 The Ataturk Museum of Thessaloniki is a historic house museum in Thessaloniki. The house is the birthplace of the founder of modern Turkey, Mustafa Kemal Atatürk, who was born here in 1881 and spent his youth. It is located behind the Turkish Consulate at Apostolou Pavlou street, number 75. The building has three floors and a courtyard. It was repaired in 1981. Most of the furniture is authentic. Any missing items were replaced with furniture from Kemal’s mausoleum and from Topkapi Palace in Istanbul. There are photographs on all the walls of Kemal at various periods of his life. Among others, the visitor can see personal objects of the Turkish leader and various papers. The fact that thousands of Turks visit the home of the founder of the Turkish Republic depicts the inspiration that Kemal Ataturk’s personality still holds today. 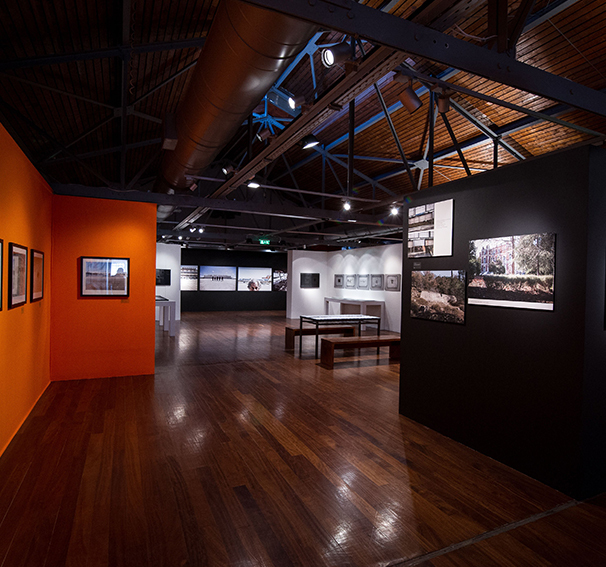 The Thessaloniki Museum of Photography is the only museum in the country devoted to the art of photography. It is supervised by the Ministry of Culture and Sports while it organizes an international photography festival every two years. The museum opened its gates in 1998 and since 2001 it is housed in Warehouse 1 at Thessalonik’s harbor. Its mission focuses on designing and presenting a series of exhibitions, creating files and collections of photographic material, and publishing books and directories. At the same time, it organises a variety of educational programs and has taken important initiatives to promote Greek photography on an international level. The holy temple of Saint Demetrious or Hagios Demetrios (Greek:Άγιος Δημήτριος) is located in Thessaloniki and is dedicated to Saint Demetrious, the patron saint of the city. It is located on the homonymous street and is a five-aisled basilica church of the “Hellenistic type”. The church features many special and rare characteristics compared to other temples of the same period in Greece. It has a transverse aisle while its inside decoration is rich in paintings, marbles and capitals. In the basement of the temple visitors have the opportunity to see the place of the martyrdom of Saint Demetrious. Αmong the temple’s mosaics, two stand out; the one depicting Saint Demetrious himself with two young children and another, depicting Saint Demetrious between the bishop and the prince, who renovated the temple in the 7th century. In the great fire, which destroyed the two-thirds of the city in August 1917, it was almost completely destroyed and restored in 1948, retaining enough of its architectural elements. Thanks to the architect Aristotle Zachos, who had kept notes, drawings and photographs, the temple was restored “from the ground” so that christians could worship the saint on 26 October 1949, the saint’s day of feasting. Some years later, in 1978, the relics of Saint Demetrious came back from the abbey of St. Lavrentius in Campo, Italy, and were placed in a silver larnax where they are kept up to now. In 1988 the temple was declared as a World Heritage Site by UNESCO. Since 1988, the crypt of the temple works as a museum exhibition where a collection of sculptures, capitals, chests and vases from the various phases of the church are exhibited to the audience. The area of Thessaloniki known as Ano Poli is built in the northwest and starts from the area above Agiou Dimitriou Street and reaches up to the Acropolis and Eptapyrgio. It is the only part of Thessaloniki that was left untouched by the great fire of 1917. The special architectural style will take visitors back to the Byzantine era. Because of its location, it was also the main fortress of the city with defensive structures created during the Byzantine and Ottoman periods. Much of the Byzantine walls have been preserved and are nowadays a jewel of the Acropolis of Thessaloniki. Upper Town can be visited on foot or by bus. Take a stroll along the cobbled streets surrounded by small, beautiful Ottoman architectural houses and enjoy the amazing panoramic view of the city and the sea, especially during sunset. Dine in the small taverns with traditional cuisine, some of them count over a century of life! You can also buy souvenirs in small tourist shops in the area near Portara and the Tower of the Triangle. 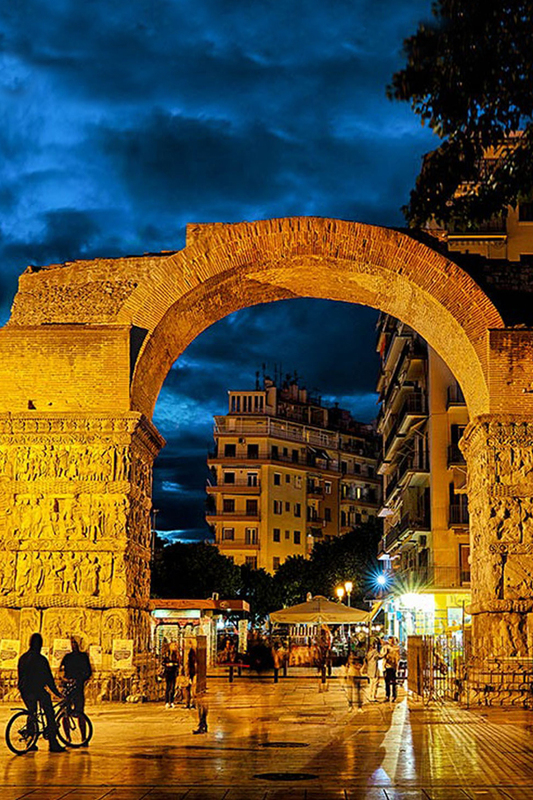 The arch of Galerious, also known as “Kamara”, is one of the most recognizable and distinguished Roman monuments of Thessaloniki. It is probably the most popular destination for both locals and visitors of the city. It is a triumphal monument that gathers many interesting characteristics of the Roman monumental architecture. It was dedicated to the victorious campaign of Emperor Galerius against the Persian Sassanids. About two-thirds of the arch is preserved. As the arch was part of the wider architectural complex that included the palace and the impressive Rotunda in a single entity, we can perceive the rich and intense presence of Romans in the city. Kamara is the most common meeting point for most of Thessaloniki and the impressively large student community in the city. It is easily accessible (Egnatia Street) while many other attractions and areas of great interest are ideally located for walking. There are a lot of cafes around the monument, full of university students. Rotunda is one of the most important Roman monuments in Greece. 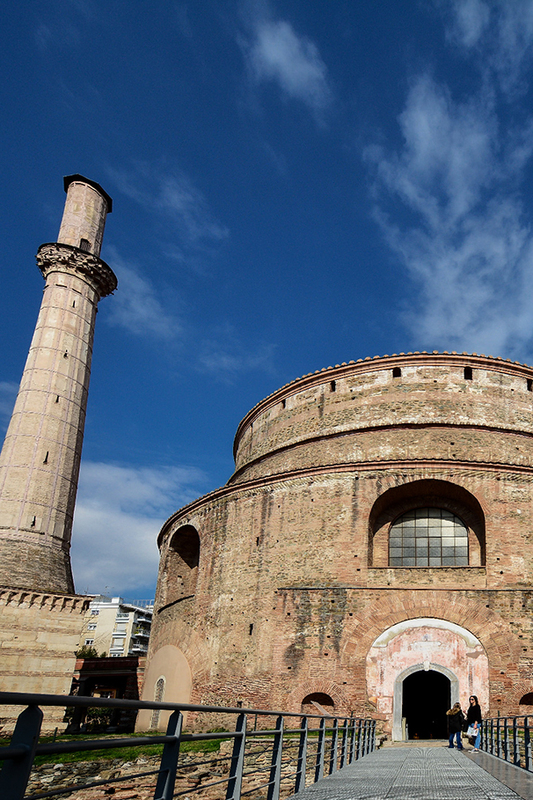 It is a 4th century vaulted round building in the eastern part of the historical center of Thessaloniki, similar to the Pantheon in Rome. Initially it was intended to be the temple of Zeus or the Kavers and the mausoleum of Emperor Galerius. Due to its non-use, it was converted during the Byzantium era into a Christian temple and after the liberation of Thessaloniki in 1912, it was dedicated to Saint George. It is part of the palace complex of Emperor Galerius and was built around 304 AD. Since 1988 it has been a UNESCO World Heritage site. 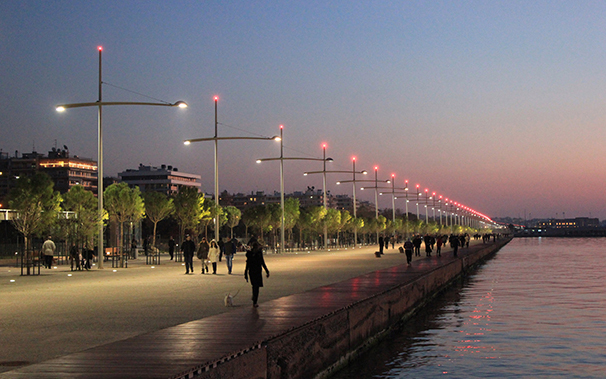 For the residents of the city, the walk (and the last few years running) along Thessaloniki’s new waterfront is a favorite habit. Αlong a linear area of 3,5 km the walker can enjoy the sun, the sea and the sky of Thessaloniki. It also offers a delimited area for bicyclists from Thessaloniki’s Concert Hall to the harbor. Visitors will have the opportunity to admire the impressive umbrellas of Zongolopoulos, the statue of Alexander the Great, the statue of K. Karamanlis, the Royal Theater, the theme parks full of green while the romantic ones can enjoy a walk with carts or relax on boats that operate as floating bars, cafes and restaurants throughout the day. 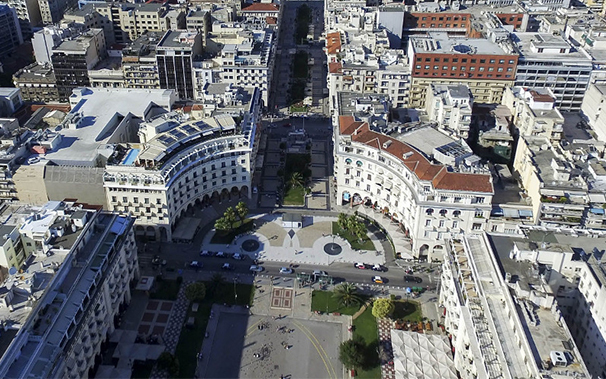 Aristotle Square is one of the central squares of Thessaloniki. It was designed by the French architect Ernst Empar in 1917 immediately after the great fire of 1917 and the incineration of the center of Thessaloniki. It starts from the semicircular buildings to the north of Mitropoleos Street and continues up to the Nike Avenue in the sea. The square is a popular spot for tourists and locals, with many cafes and restaurants and is also a place of political gatherings and various artistic events. The imposing corner buildings house the Olympion cinema, where the International Thessaloniki Film Festival takes place and the Electra Hotel. Just above the square, the remnants of the Roman Agora were discovered making it a place of attraction for many tourists. On the left and right side of Aristotle Square, guests can find the traditional and well-known trading markets: Modiano, Kapani and Athonos. The abundance and differentiality of the people who lived in the city over the centuries with their eating habits mixed and assimilated over time, the combination of eastern flavors with European cuisines, the love and passion for life that characterizes the inhabitants of Thessaloniki are some of the reasons that led to the creation of gastronomic masterpieces in the ouzeri, taverns and restaurants of the city. Thessaloniki is the gastronomic metropolis of Greece, a crossroad of tastes, a marriage of tradition and avant-garde. 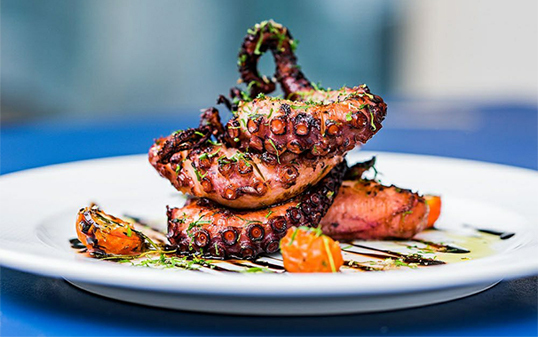 The Byzantine customs and the traditions of the Greek refugees from Constantinople, Pontus and Asia Minor were mixed with Jewish and Balkan tastes, and together with French gastronomy they created the special gastronomic profile of the city. Enjoy your morning coffee along with a bougatsa, salty or sweet and a sesame bun (koulouri). Taste filled tsoureki and trigona Panoramatos with a warm salem. 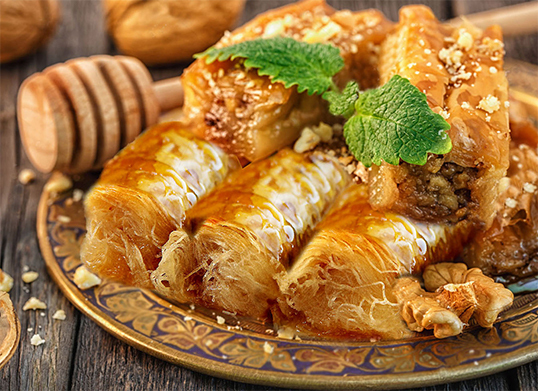 A lot of ouzeri and local restaurants can be found all over the city, ready to welcome and offer intense gastronomic moments to the visitors: seafood, fresh fish, fresh herbs, pine nuts, raisins , various spices and, for dessert, traditional syrupy sweets or yoghurt with conserve. 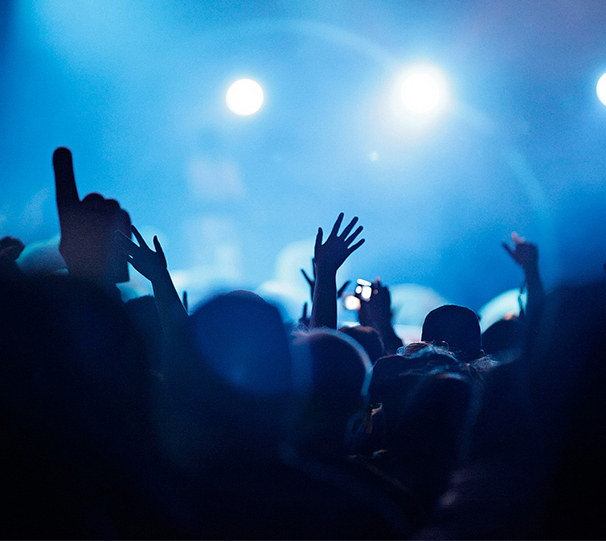 Thessaloniki offers many entertainment choices for all ages, economic means and moods: cafes, bars, clubs, folk and rock stages, wine bars, cinemas, entertainment venues. It is the largest cultural and intellectual center of the Balkans, with one of the finest and largest Universities. For this reason, exhibitions of paintings, book festivals, book presentations, concerts, dance and theatrical performances, operettas and musicals are held in the city on a frequent basis. Furthermore, the film festival, held every November since 1960, and the documentary festival, held every March since 1999, are the attraction for many tourists, journalists, artists and filmmakers. It is also worth getting informed about the Theater and the Music Theater programs that take place during your stay in the city. The presence of students gives a continuous flow of entertainment in the city with many musical and dance groups from Greece and abroad performing here. During the summer, fun does not stop in the city. The floating bars in Thermaikos, the bars near the sea, the summer cinema along with a cold beer and, of course, the three open theaters offer moments of relaxation and entertainment to locals and tourists. The large streets of Thessaloniki house the largest market in the Balkans. Tsimiski Street, Mitropoleos Street, Proxenou Koromila Street and Egnatia Street as well as major shopping centers such as Mediterranean Cosmos, Notos Galleries, One Salonika and Macedonia host a fashion paradise for clothing, footwear and grooming. However, it is also worth taking a walk in the traditional markets of Thessaloniki: Modiano, Kapani and Athonos, which are on their own a unique attraction of the city. 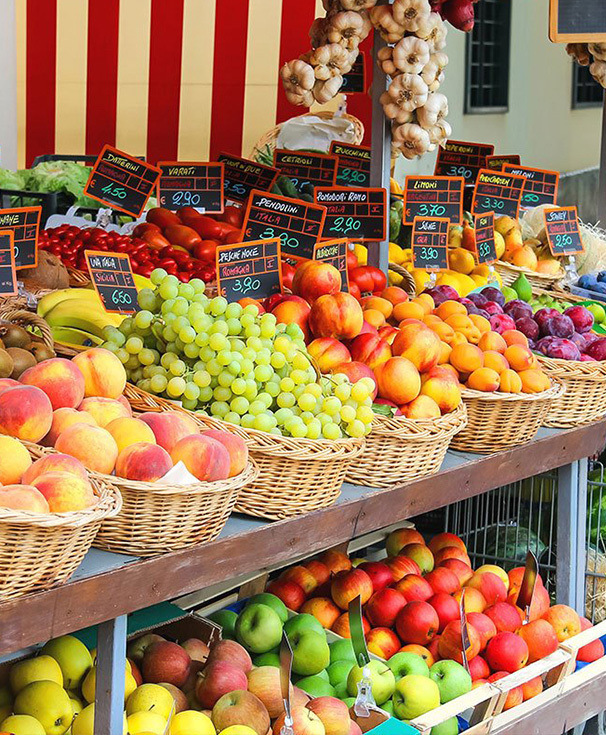 Foods, spices, seafood, meats, fresh fish, vegetables and fruits, clothing and footwear, and many other small treasures can be found within the sheltered markets that capture daily the pulse of the city and the lives of its inhabitants.